Inquiring minds need a place to explore: our new 70,000-sq. ft. facility provides a state-of-the-art home for all of the disciplines in Saint Francis University’s School of Sciences. 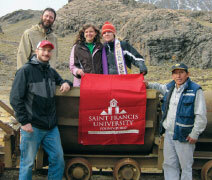 Real-world experience and a dedication to service learning is the hallmark of Engineering at Saint Francis University in Loretto, Pennsylvania. In our program, you will learn to use math and science to solve some of the most important problems facing society today, and we believe you should start putting your skills to good use even before you graduate. Our students put their education into action with design projects for class, paid internships, summer research, and engineering service projects both in Pennsylvania and abroad. By combining classroom learning with authentic projects, our students develop the wide variety of skills needed to be successful in the rapidly growing field of engineering. Environmental engineering is one of the fastest-growing professions in the United States. Environmental engineers use the principles of science and math to manage ecosystems, restore polluted lands, and protect our soil, air, and water resources. These natural resources are just what people need to lead healthy and productive lives, and, accordingly, environmental engineers are in high demand. The University’s rural, mountainous setting makes it the perfect location for an accredited Environmental Engineering curriculum that can move fluidly from classroom to field site. 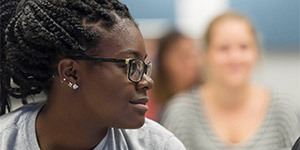 Students in the program prepare to be leaders in the environmental engineering profession by focusing on lab-scale experimentation, field-scale design, theory and computer modeling, written and oral communication, and ethical decision making. Classrooms without walls: Our students get experience in the field and in the lab as well as behind a desk. SFU classroom settings match the workplace environment. Communication skills in every class: Engineers need to be able to explain their ideas to others. Our students practice communication skills in every engineering class they take. Internships and summer research positions: Engineering majors can gain valuable experience while they are still in school. We help our students get connected with internship experiences and summer research. 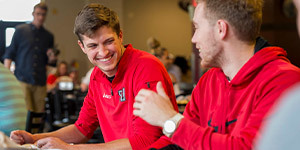 Individualized instruction: With Engineering class sizes averaging between 10–15 students, you’ll get one-on-one attention from the professor. Real-world design projects: Our students work on real design projects drawn from our partners in industry and nonprofits. A solid grounding in the liberal arts: We expect our graduates to become leaders in their professions and their communities. A liberal arts education rooted in tradition gives them the solid background needed to take a Franciscan approach to engineering.